James Wellock travelled to Italy to meet the family behind Zanetti, a company which sells the very best Italian cheeses around the world. 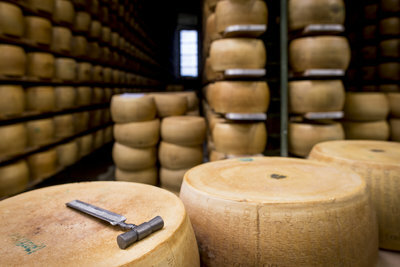 In the ‘cathedrals’ of cheese, he found out how its Grana Padano and Parmigiano Reggiano cheeses are made. After a wonderful Ryanair flight over the stunning Alps, we arrived in Bergamo where we were met by Valentina Zanetti. Ten minutes later we were in the beautiful old town, completely walled in and perching up on a hill, overlooking the new town. The piazza oozed history with a large church at one side, library opposite and the university in between with the obligatory restaurants dotted in amongst. We settled into one and Valentina promptly ordered the local Ca’ del Bosco – a sparkling white wine – and the ambience was set. We were joined by her father Attilio, managing director of Zanetti; her cousin Paolo, director of international sales, and Pietro, the export manager. 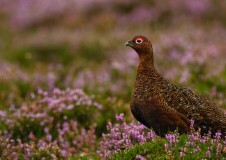 Feeling truly honoured to have been joined by such company, we were treated to a veritable feast! An early start saw us set off for Marmirolo to see the production of Grana Padano. We were greeted by Rodolfo, production manager, the fifth generation of the family to work for the company, just as the morning’s fresh milk arrived. 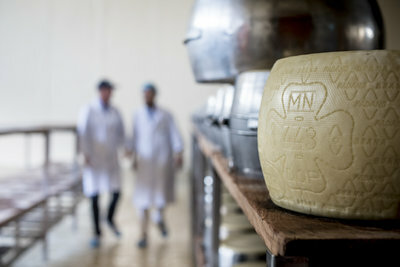 The production of Grana Padano is all about the milk which has to come from within a 40km radius. Depending on the time of year, Zanetti takes delivery of between 300,000 to 600,000 litres a day, seven days a week – wow! Before the tanker is unloaded, the milk is tested. Once it’s given the ok, it’s unloaded into big holding tanks where the milk separates and the fat (ie the cream) rises. This is then removed and sent for mascarpone production. All the bacteria attaches itself to this so the remaining skimmed milk is even more pure. We entered the production area in all our finery (hair nets and all) to be greeted by long lines of copper cauldrons with cheesemakers buzzing all over them! A thousand litres of milk are released into one copper cauldron, making 100kg of cheese which, after maturing, becomes approximately 70kg – staggering! However nothing is wasted here! The whey that is left over is drained from the cauldrons and, guess what – it goes straight to the pig farm – on the same site. This is a long story for another time, but is also why Parma Ham is DOP (which means it has a controlled designation of origin). The next step is releasing the calf rennet into the milk. Taken from one of the calf’s five stomachs, this is a very expensive process and another part of the tradition is that the calves have to be from the same area – separated from the Reggiano production centre by the Po river. The milk is heated to a very precise 43°C (the traditional measure of temperature is on the Reaumur scale) and this lasts for about 20 minutes. This is where the head cheesemaker plays such an important role – he is constantly testing the curd with his hand to get the exact time when it’s ready to stir. The test is that when he lifts it and it splits into two distinct halves across his fingers, the stirring begins! Once he is happy with the consistency of the cheese bits, it is allowed to settle onto the bottom of the cauldron. Once settled, the large piece of cheese is cut in half and a large wooden paddle is sunk to the bottom to retrieve the two halves. This is where the teamwork really starts – and the two guys are so slick. With muslin cloths and two wooden poles, they capture the two cheeses and hang them on an aluminium pole to start draining the whey. Another two guys take the pole into the next room where the cheese is washed in warm water and then put into its first mould. The cheeses are turned each hour for the next 24 hours with new cloths added to extract the whey – amazingly it rises up out of the cheese. Next it’s into an aluminium mould (called a fascera) to get the shape perfect. 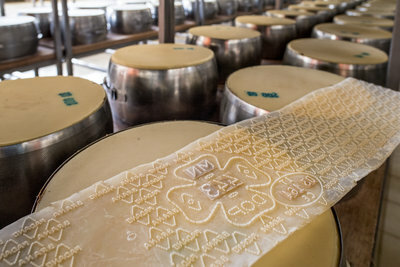 At this stage the plastic strips denoting that it’s Grana Padano with the factory number, milk batch and date etc – a cheese passport in effect – are moulded into its entire circumference. Two days later the cheese goes to its next home, big tanks that take 40 cheeses stacked on shelves and lowered in by crane. Here, the cheese wheels are brined. This process, which lasts between 16-25 days, removes the last of the whey and also adds salt to the cheese through the process of osmosis. This is when the flavour starts to develop. From here it’s into the cathedral of cheese and boy, what a scene when you enter the maturing warehouse! 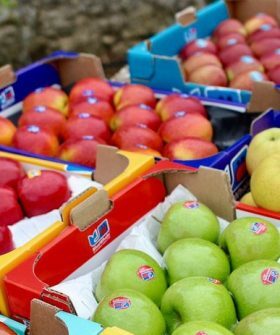 The first thing to hit you is the smell – wow! Then it’s the sheer scale of the place with its row upon row of cheeses – stacked 52 cheeses high. It is overwhelming. You get a sense of the size of the structure from the machinery that automatically brushes each cheese and then turns it over. The cheese matures here for nine months and throughout this stage they are tapped with a small hammer to see if they have any hollows inside or any cracks, and tasted with a small screw-like device. Any cheeses found to be less than perfect at this point go off to be grated – the rest can be sold whole or cut. The cheesemakers also test for the very best ones which are then selected for extra maturing – the optimum time is 20 months. The ones that pass this are then fire branded and we were so lucky to see this taking place. 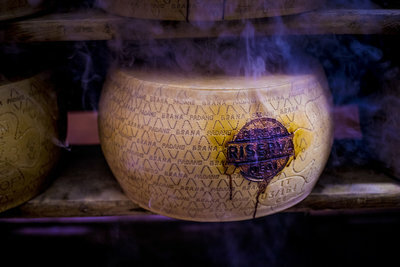 The fire branding is done by an independent expert who works for the Grana Padano Consortium. He has to agree to a cheese being branded – and these are the cheeses that Wellocks selects for our Special Branch Extra Reserve. We were then joined by Antonio, the godfather of Zanetti. 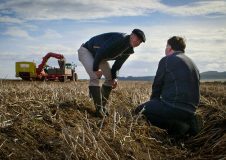 At 91 years old, it is fair to say he has had a major say in the building of the company since 1900. We were so honoured that he had come to greet us on our visit! Antonio oversaw the cheese selected to be cracked open for us and we were blown away again by the smell and the flavour. Small lumps of crystallisation are mixed in, adding another dimension to the wonderful nutty, creamy flavour. A busy morning was then rounded off with a short journey to the beautiful town of Mantova with a fresh pasta lunch, drowned in freshly grated Grana Padano – Zanetti of course! A little stroll around the town brought us to the Church St Andrea, started in 1462 and finished in 1790. Once inside it revealed itself as a wonder of elegance and detail. We then set off to Panocchia to discover how and why Parmigiano Reggiano could be different to, or even better than, the Grana Padano. I was immediately put straight that you cannot call Grana Padano Parmesan! It is only Reggiano that is called Parmesan. This was apparent as we crossed the river Po and the big signs told us we were entering this area. 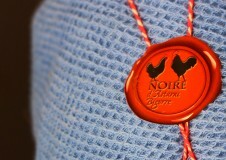 Oh, yes – this community is very proud of their world famous cheese! Paolo and another Antonio (yes, you guessed it, he is fifth generation and now factory manager) showed us another massive, amazing Zanetti factory, built in 2012, which really showcased where this business currently is – right at the top of its game! The investment in the packing facility must have been staggering and I can see why no photography allowed in this area. Bespoke computerised lines ensure there’s no loss of cheese but accuracy all the way in the cutting, grating and shaving. It’s truly staggering. We then went to the maturing room and found out that across the business at any one time, they have one million wheels being nurtured. Yet another cathedral of cheese. So why is Reggiano different? It is all down to the milk. Yes, it comes from the allocated region but here it is 50% full fat and 50% skimmed, meaning it has fat content. 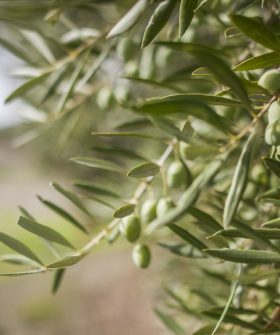 This is why it spends longer maturing, ranging from 18 months for the standard and then up to 36 months for the Special Branch Extra Aged. Time, as they say, is money and this is why it has a premium over the Grana Padano. After selecting a 36-month Special Reserve Reggiano, Paolo passed this on to specialist maturing manager Marco Freddo, recognised as one the best in this sector. Using his tools, he carefully inserts small knives and, hey presto, the wheel is in two halves. You could see the pride in all their faces as three years of hard work is showcased! 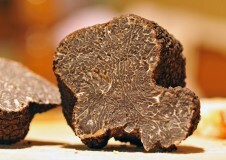 The aroma was breathtaking and, when I tasted it, wow! My mouth went dry at first but the salt crystals were igniting the taste buds and the saliva was now in full flow. Then the creamy flavours hit me and started to roll around. One mouthful wasn’t enough; I wanted more – what a feeling! Both cheeses were simply stunning, with a sharp nutty flavour profile and I loved the grainy texture. 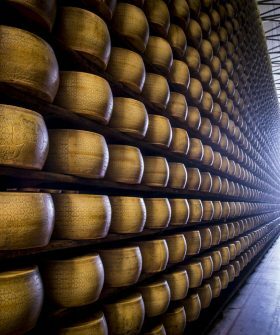 As the Reggiano is matured for longer and has a fattier mix of milk, it has a more robust, intense and lingering flavour with the Grana Padano being slightly more creamy and less salty. The choice is yours as always and I can definitely say you cannot go wrong with either of these cheeses. To see the pride that not just the family but also the local people and the Zanetti staff take in producing these two cheeses really was an experience and a pleasure and you can absolutely see why it is worthy of DOP. Two days I will not forget in a hurry! Both cheese are available from Special Branch now.